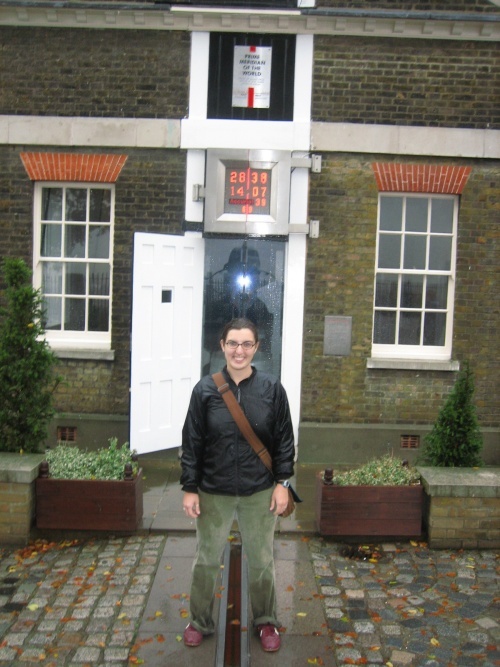 Some of you might be aware that Greenwich is home to the Prime Meridian, which is where East and West meet (at least longitudinally). 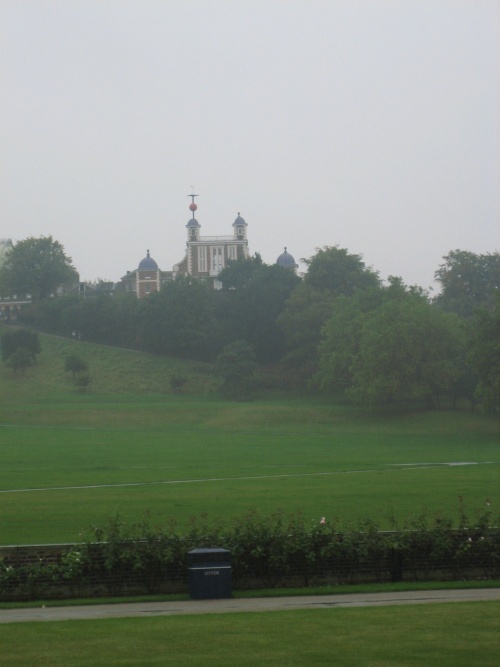 Were you aware how close Greenwich is to London? It’s actually right on the southwest edge of the City and an easy tube ride to it. Well, maybe you all do and I’m just being silly, but it’s one of those destinations I’d been wanting to see for many months. On one of the days when I was working, Carolyn found an interesting way to see the tourist parts of London — London Walks. It’s a slightly quirky way of getting a tour of London. Well, on one of my days off, we found one which would start over near the Tower of London then take the river ferry over to Greenwich for more edu-ma-cation. We thought it would be fun. And it was, except for the driving rain that didn’t let up until we were almost home and soaked to the bone :). It’s a pity since Greenwich is very much about being outdoors. In its history it has been a favourite haunt of the royals as well as a rich maritime history. 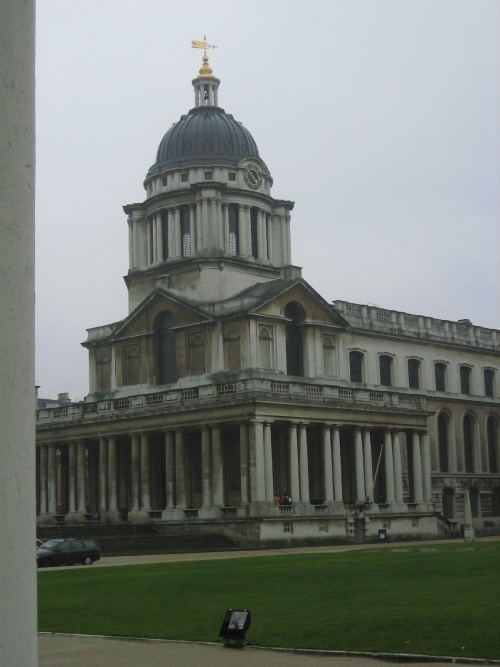 It’s been a naval hospital and is currently home to the University of Greenwich. As a result, it has tons of amazing architecture as well as the royal observatory which is why they chose it to be 0 degrees longitude. Here’s a little fun in photos for your enjoyment. This is part of what used to be the Naval hospital. After many years of living the tough life at sea, this ain’t a bad way to spend some time resting your days out. Here’s a view looking up at the Royal Observatory. Yes, in this weather, we still hiked up there. At 1pm every day, that red ball rises up and then drops (like New Years in Times Square every day!). After the walking tour ended, we took a little time to warm up in a pub with a pint and some good food (Shepherd Neame make some good pies as well as ales). 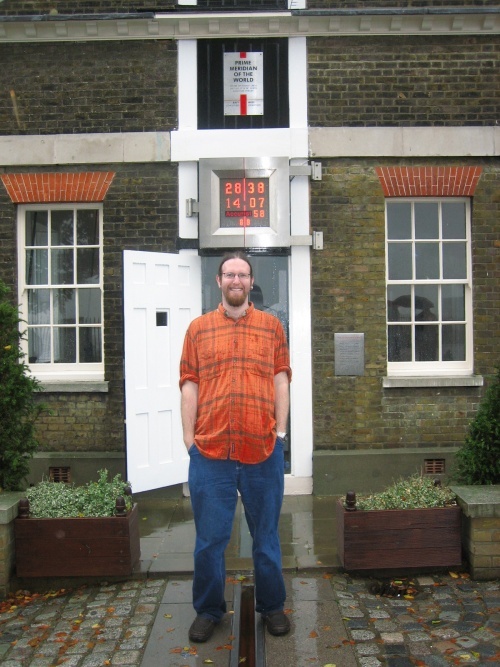 Then we made the hike up the hill, got a little lost and found our way to the Prime Meridian. Here’s Carolyn straddling two hemispheres! Here’s a slightly taller (but no less wet) Matt in the same spot. hurrah! This entry was posted on Tuesday, October 23rd, 2007 at 3:28 pm	and is filed under London, Photos. You can follow any responses to this entry through the RSS 2.0 feed. Both comments and pings are currently closed. Sigh. I love England and am very jealous of the two of you. Make sure you invite your old mom and dad for a visit – I’ll make the tea! I’ve been there! (granted, over a decade ago) Looks just the same. Entries (RSS) and Comments (RSS).20 queries. 0.356 seconds.